The cherry fruitworm (CFW) is a univoltine moth, native to the U.S., and whose larvae preferentially infest rosaceous and ericaceous fruits. CFW larvae have been confirmed infesting rabbiteye blueberries in Mississippi, and this typically northern pest’s appearance may represent a new State record. Without careful pest scouting after petal-fall, CFW-induced damage and fruit drop will often go undetected until berry losses become too severe for effective insecticide management. Scouting therefore is critical for managing CFW populations. Although the small and nocturnal adults of CFW can be elusive, there are excellent pheromone traps available for monitoring the activity of adult males, and by association, the destructive egg-laying females. Females oviposit on the calyx of blueberry fruit, much like cranberry fruitworms do. Upon eclosion, the larvae of CFW bore into fruit. It is at this stage of larval development that environmentally safe Bt insecticides are the most effective against CFW caterpillars. As larvae mature and become larger and more heavily sclerotized, they become harder to kill with Bt. However they are at greater risk of attack by predators and parasites because, unlike cranberry fruitworms, they do not erect silken webs around their feeding sites. Mature CFW larvae that are preparing to pupate avoid ground-based dangers by taking refuge in dead unproductive wood of blueberry bushes and other nearby vegetation. Removing old unproductive canes may reduce overwintering populations of CFWs and hence temper the severity of subsequent spring outbreaks. A longer article with a fuller description as well as photos is forthcoming in the July-Sept issue of the Mississippi Vaccinium Journal. There are many pests of blueberries in Mississippi; however, most of them are easily controlled or do not create an economic amount of damage. For many years blueberries in Mississippi have been grown with little pest control inputs, especially Rabbiteye blueberries. This past year, 2012, initiated a whole different problem — Spotted Wing Drosophila. We believe the pest has been here for some time, but perhaps it was the mild winter that allowed its populations to explode. Many growers complained of its damage — mainly leaky berries. The issue is, “How do we control it?” A simple question, with a not-so-simple answer. 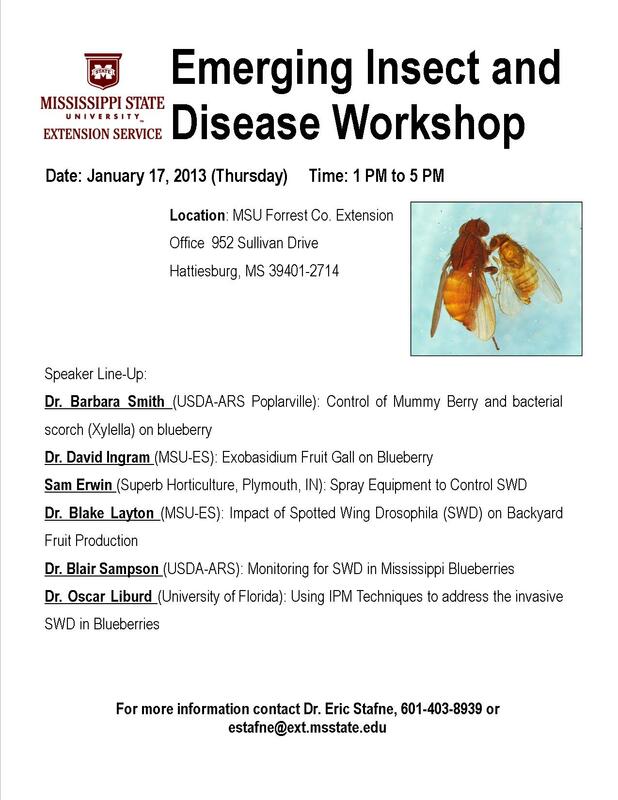 So, Mississippi State University-Extension Service and the USDA-ARS have teamed together to put on a workshop for growers to learn about this insect and potential control measures. Other pests, Exobasidium and Xylella will be addressed as well. The workshop is open to anyone, not just blueberry growers, who wants to learn about these pests. The Gulf South Blueberry Growers Association has also been generous enough to bring in a couple of outside speakers — Dr. Oscar Liburd from the University of Florida and Sam Erwin from Superb Horticulture in Indiana. See the information below for details and please pass it along to anyone who will find it useful.